The largest stern-wheel steamer in the world arriving in Burlington, Iowa (the birthplace of Jim Clary), this painting was completed in the Fall of 2012. Carl D. Bradley Wreck - View 2 | Bow View. The Bradley wreck was discovered and filmed by the DeepQuest Expedition of ‘95 & ‘97. The Bradley wreck site was first visited when explorers Jim Clary and Frederick Shannon, using the deep ocean submersible Delta, filmed the wreck in 1995. The last survivor Frank Mays descended to the wreck himself, dropping a memorial plaque at the site. Then in May of 1997, using a deep ocean robot, over twenty-four hours of film was obtained, which proved that the Bradley broke in two before sinking. The Carl D. Bradley’s sinking in Northern Lake Michigan in November 18th, 1958 claimed more lives than any other recent Great Lakes disaster. Thirty-three sailors were lost that night in one of the twenty-one Great Lakes hurricane-type storms which have assaulted these waters since 1835. The Highlander Sea is a 154’ long gaff-rigged two masted schooner, designed by Starling Burgess and built in Essex, Massachusetts in 1924. The ship was originally named “Pilot” and for 47 years she carried ships’ pilots to assist the larger ships coming in and out of Boston Harbor. “Now we’re really In For It,” might have been the mournful expression heard aboard the Cape Horner after the mainsail blew. 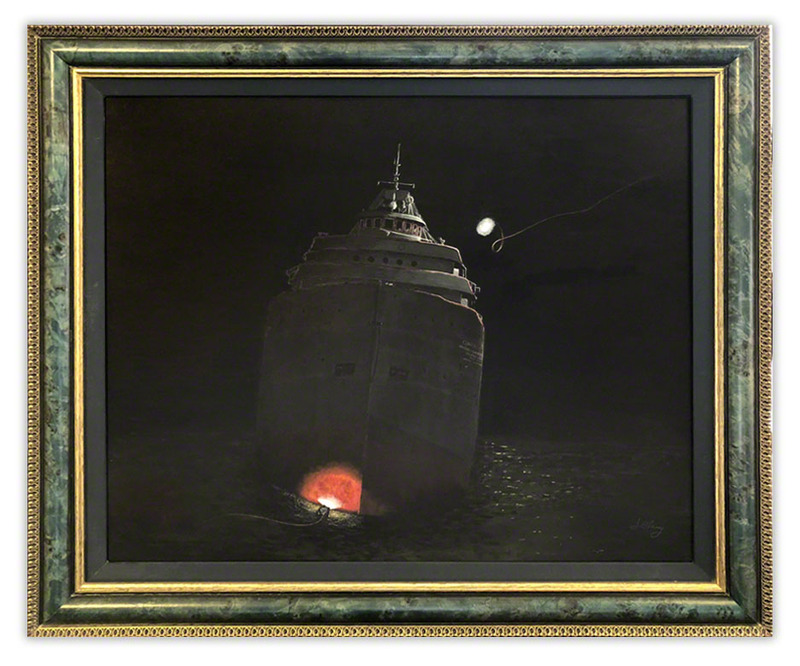 Between 1990 and 2011 Jim Clary set brush to canvas and portrayed this, and 16 other race boat scenes for the Famous Thunder Series. Thick rooster tails, tight turns, and famous guys behind the wheel(s) pass by excited crowds, and local landmarks to depict the sheer thrill of the sport. Here, Master Tire takes a tight turn and throws a massive rooster tail in 2000. The Stewart J. Cort was the first 1000-foot vessel on the Great Lakes when she entered service in 1972. She is the ONLY 1000-foot freighter with the pilot house forward, She carries iron ore on her regular route between Superior, Wisconsin and Burns Harbor, Indiana. Cutting through waves - “The Pointy Part” of any vessel is called - the bow. In early years many tall ships would bring fresh cut pines from the North and deliver them to harbors through the Great Lakes where joyful citizens waited for the Christmas season to begin. J. Clary depicts this scene with a horse drawn buggy carrying off the first load of trees. For many years J. Clary held a December month-long benefit for the Salvation Army selling his prints and donating the proceeds. This painting was offered in 2012. The Canadian Pacific Railway Co. liner Empress of Ireland departed Quebec on May 29th, 1914. Destined for Liverpool she encountered heavy fog. Sometime after midnight a much denser fog encompassed the area and the Norwegian collier Storstad made a tragic starboard turn directly into the starboards side of the Empress. With her electric ppower fading away, only one S.O.S. call went out. Within fourteen minutes the grand Empress sank with the loss of 1,106 souls. Built in 1825, Fort Gratiot Lighthouse was the first lighthouse on the Great Huron. However, the eighty-six foot tower as it stands today was built in 1861. Originally it was constructed immediately North of Fort Gratiot, an outpost established in 1814, to protect Americans against British attack. In 1828 it was completely destroyed in a violent storm then rebuilt at a cost of $4,445. The beacon was put back into service in 1829. The lighthouse has the distinction of being the oldest surviving lighthouse on the Great Lakes and was automated by the Lighthouse Service in 1933. Most of its original design and equipment has remained. “Gratiot Light Greeting” - Jim Clary’s first Holiday Edition work depicts an 1888 evening scene of the David Dows passing by the Fort Gratiot Lighthouse at Christmas time. The captain of the ship, and the captain of the tugboat would negotiate a price to be towed down the river because sailing ships could not navigate the narrow breadth of the water.